This Fact Sheet provides Age and Service requirements for various Tier 6 retirement plans at a glance. This application is for Tier 6 63/10 and Special Plan members who are applying for Disability Retirement. An overview of the 63/10 Retirement Plan for Tier 6 members. 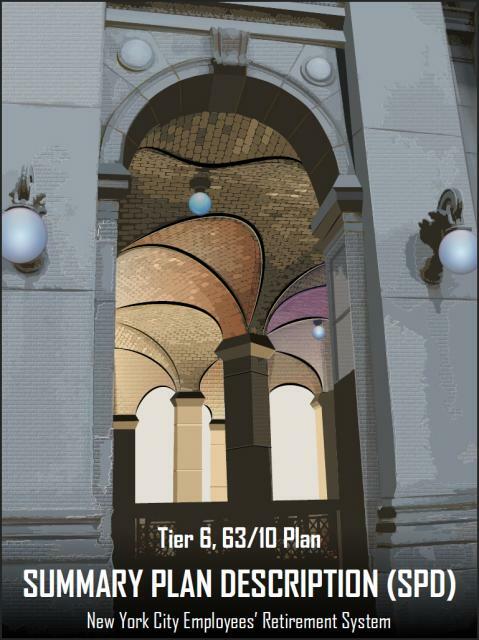 The New York City Employees’ Retirement System (NYCERS) is pleased to present the Tier 6, 63/10 Summary Plan Description (SPD) booklet. If the information you are looking for is not available online or over the phone, please use this form to submit your request in writing. Use this form to change how much money is withheld from your monthly pension check toward federal taxes. Retirees with a MyNYCERS account and a registered PIN can change their Federal withholding online instead of submitting this paper form. An overview of NYCERS’ policies and procedures for processing a death benefit claim. By filing this form, you consent to report your annual income to NYCERS while a disability pensioner. This form must be completed by your employer. This form contains your physician’s medical report and your authorization to provide information to NYCERS’ Medical Board. This form must be filed along with your application for disability retirement benefit. If you received a retro payment from your employer after you retired from City service, use this form to have your pension payments recalculated. Information about loan eligibility, borrowing capacity, and filing and processing a loan application for members in Tier 3, Tier 4, and Tier 6 Basic and Special Plans. If you accept another position with the City or State of New York (or any of its political subdivisions) that entitles you to membership in another City or State retirement system, you may use this form to transfer your NYCERS membership to that system. For NYCERS members who are eligible for membership in the NYC Teachers Retirement System and elect to remain a member of NYCERS as a Transferred Contributor. Retiring from your City job is an important step and the beginning of an exciting time in your life! On a practical note, it’s a process that will take at least a few months to complete and can go more smoothly if you fully understand what to do and what to expect. 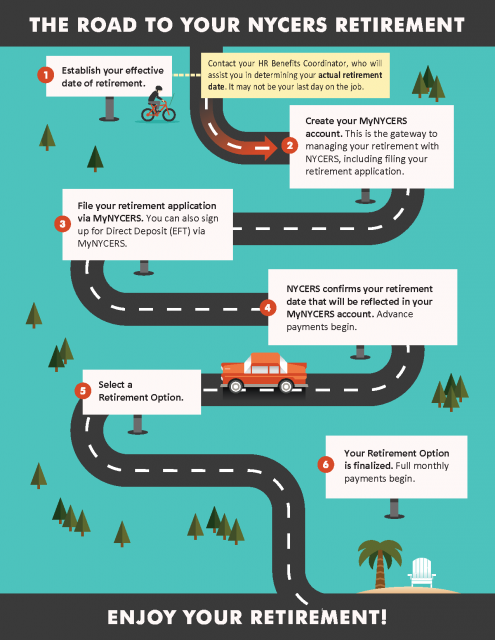 Here at a glance are your 7 Stops on the Road to Retirement. For Tier 3, Tier 4, and Tier 6 members who wish to nominate Primary and Contingent beneficiaries to receive a death benefit payable upon the death of a member while in active City service. For Tier 3, Tier 4, and Tier 6 members who wish to nominate one or more beneficiaries to receive a death benefit payable upon the death of a member while in active City service.